The Michigan eviction notice forms may be used in the event that a landlord in Michigan seeks to terminate a lease for nonpayment of rent or for noncompliance. In addition, Michigan has a 24-hour notice to quit when the tenant is engaged in illegal drug use. If tenant does not respond to the notice, the landlord may proceed with a filing a Summons (DC 104) and Complaint (DC 102c) with the local District Court in the county in which the property is located. The court will schedule a hearing within ten days and issue a judgment. If the judgment is for the landlord, tenant will have ten days to move out. After the ten days, Landlord can apply for a Writ of Eviction (DC 107) from the court, at which point landlord may obtain the services of a sheriff to physically remove the tenant and tenant’s belongings. Eviction Proceedings – Use This Guide as a helpful resource to understand the court hearing process. 24-Hour Notice to Quit (Illegal Drug Related Use) – Pursuant to § 554.134(4) if illegal drug-related use on the property is occurring the landlord may terminate within one (1) day’s notice. 7-Day Notice to Quit (Non-Payment) – Pursuant to § 554.134(2), the landlord may serve notice on the tenant if he or she fails to pay the rent when it is due under the terms of the lease. 7-Day Notice to Quit (Non-Compliance) – Pursuant to § 600.5714, the landlord may ask a tenant to leave the premises if he or she is violating the lease by providing seven days notice of his or her intention to seek eviction. 30-Day Notice to Quit (Month to Month) – This type of notice is used when landlord seeks to end a month-to-month tenancy. Rent is due as set forth in the lease. Landlord may provide a notice to quit at any time after rent is late. A tenant may “cure” the breach by paying all the rent that is due before the end of the notice period. Step 1 – The first step before eviction proceedings can begin in court is to provide one of the following notices to the tenant. You may seek eviction if tenant fails to pay the rent, breaches the contract, is engaging in illegal drug activity or because the tenant holds over on a lease after being asked to move out. Step 2 – After tenant has received the requisite notice and doesn’t respond appropriately to the notice, by either curing or moving out, landlord may seek redress in court. The first step is to go to the District Court representing the area in which the property in question is located. You will then file a Summon (dc104) and Complaint (dc102c) with the court, pay the fee (the amount depends on the court) and provide a copy of the notice you sent and the lease, if there is one. Step 4 – If the tenant does not show up and/or there is a judgment in favor of the landlord, tenant will have ten days to vacate the premises. If tenant does not vacate within that time period, landlord will then have to apply to the court for a Writ of Eviction (dc107), whereby the landlord indicates that there has been a judgment in his or her favor, but tenant has not complied and so landlord is now seeking authorization for the sheriff to physically remove tenant from the premises. Decide upon the file type you wish to use (PDF, ODT, or Word), then download the Michigan Notice To Quit form directly by selecting the appropriately labeled buttons below the image. Generally, one should also have the Lease concerning the Agreement being addressed handily for review as some information will need to appear identical in both documents. The Property the Notice is concerned with must be established in this document. The City, County, Zip Code, Building/Street, and Apartment of this Property should be reported precisely as it appears on the Lease across the available spaces in the first sentence. 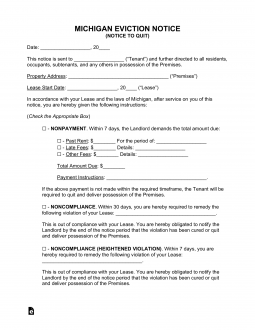 The Lease at the center of this Notice must be confirmed by reporting the Signature Date on the agreement in this Notice on the second sentence utilizing the blank spaces provided. The next section contains several check boxes of which you must choose one. Read each one carefully before choosing to make sure your choice applies to the situation. You should be prepared to fill out additional information regardless of which statement you choose. Choose the first statement if you are a Landlord that must issue a Seven Day Notice to pay an Overdue Rent Amount or relinquish possession of the Rental Property. Be prepared to Name an alternate Agent who is approved to accept the Tenant’s rent payments, the Amount Owed, and the Mandatory Rental Period that must be paid for. Choose the second statement if you are a Landlord who must issue a Seven Day Notice (to a Tenant) stating that his or her Violation of the Lease Terms must be corrected or the Tenant will be expected to give up the Rented Property to the Landlord. Be prepared to describe the Lease Term Violation the Recipient of this Notice must correct on the blank space. Choose the third statement if you are a Landlord issuing Twenty-Four Hour Notice, that as a result of Illegal Drug Related Use, the Tenant must surrender the Rental to the Landlord. Be prepared to describe the Drug Use on the blank space provided. Choose the fourth statement if you are a Landlord issuing a Thirty Day Notice that a Month to Month Tenancy will Terminate for the Recipient. Be prepared to report the last day the Monthly Rental Agreement will be in effect using the blank spaces. Choose the fifth statement if you are a Tenant issuing a Thirty Day Notice that a Month to Month Tenancy will end for the Recipient on the Date you report in this sentence. After defining the purpose of sending this Notice, a Landlord or Owner (issuing this form) must provide a Signature on the Signature line below the Paragraph requiring the Recipient to comply with it or possibly face legal consequences.